Anglers Adventures’ home base is Ketchikan, Alaska, which is known as the Salmon Capital of the World. 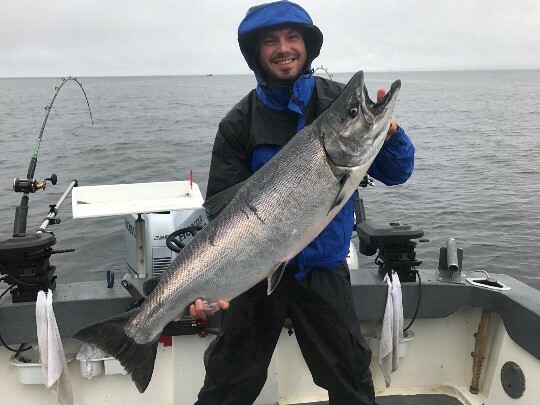 So if you are looking for a fishing adventure and want to do it in the best place in the world for salmon fishing, and also one of the most beautiful cities in the world, Anglers Adventures has the fishing charter for you. We offer multiple fishing charter options for our valued customers. If you want to get a taste for King salmon fishing, you may want to start with one of our half-day charters. We also offer full day charters, multi-day charters as well as custom charters. No matter which charter option you choose, however, we do our best to take care of all your fishing needs. We do the work to get you to your fishing location and provide all the gear you need. You will receive the bait, tackle, and lures necessary for landing your prize. Additionally, we offer drinks and snacks to keep you hydrated and energized during your fishing adventure. We even provide rain gear to keep you dry when the weather is wet. If you are a first-time or novice fisher, we will also give you the benefit of our professional guidance so that you can maximize your fishing experience without worrying about not knowing how to do it. If you are a more experienced angler, we will enjoy exchanging tips and experiences with you. Your Ketchikan Alaska King Salmon Fishing Charter will happen on The Sierra Dawn, piloted by Captain Brian Ringeissen. Brian is a highly trained mariner who prioritizes safety first, adventure a close second, and ensuring that you have all you need to enjoy fishing for the highly prized King salmon, third. To schedule a charter or ask questions, call us at (907) 254-0880, or send an email to brian@anglers-adventures.com. We will respond promptly.